Image caption Mr Carney said that any increases in interest rates would be "limited and gradual". The Bank of England has acted like an "unreliable boyfriend" in hints over interest rate rises, according to MP Pat McFadden. The Treasury committee member accused the Bank of a lack of clarity about possible rate rise timings. 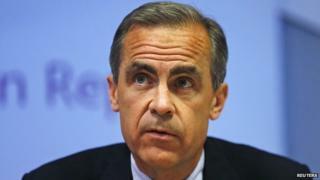 The governor of the Bank of England, Mark Carney, said the Bank's guidance had reinforced economic recovery. He said the timing of an interest rate rise will be fluid, and will be "driven by the data". Mr McFadden said that businesses and consumers had been "left not really knowing where they stand" by statements made by the Bank. "We've had a lot of different signals," he said. "I mean it strikes me that the Bank's behaving a bit like a sort of unreliable boyfriend. "One day hot, one day cold, and the people on the other side of the message are left not really knowing where they stand." The Bank of England was likened to an unreliable boyfriend today as some MPs felt it had sent mixed signals over the timing of future interest rate rises. Labour MP Pat McFadden pointed out that guidance had changed from 2016 to 2015 to possibly this year creating confusion. The Governor Mark Carney defended the banks record saying it had changed its guidance as the facts changed and said unemployment had fallen faster than expected while wage growth had been slower. Deputy Governor, Sir Charlie Bean, in his last meeting before the Treasury Select Committee, said he expected pay to start rising more quickly in the second half of this year. The financial bookmakers now make the turn of the year as favourite for the first rate rise in over 5 years. Guidance from the Bank was initially that rates wouldn't rise until 2016, but then market expectations shifted to rates going up in 2015, he said. A further hint from Mr Carney that rates may go up before 2015 had left businesses and consumers confused, he said. Mr Carney said that bank guidance had helped to strengthen the economy. "Businesses understood the first phase of guidance and acted on it. Many of them acted on it [with] hiring and investment that reinforced the strength of the recovery and the balance of the recovery." Mr Carney told the Treasury Committee that his earlier hint of a rate rise before the end of the year was intended to spur markets to adjust expectations. The bank also intended markets to tighten as a response to the hint. He added that the economy had beaten expectations, but that certain elements of the economy, such as earnings, had still not really grown. Mr Carney hinted earlier this month that a rate rise "could happen sooner than markets currently expect". He explained to the committee that his comment had been designed to spur the markets to assess and re-assess the likelihood of a rate rise based on shifting economic data. In a research note investment bank RBC Capital Markets said that Mr Carney wanted investors to be more responsive to economic volatility. "Our analogy of his message would be that it is time to take the stabilisers off the bikes of market," said RBC economist Sam Hill. "For all the criticisms of forward guidance the governor appears to be feeling the need to remind markets that in the post-threshold guidance world, the formulation of market rate expectations should be more sensitive to volatility in the data than it has been," he added.